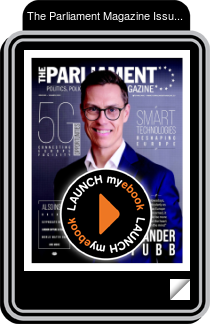 Former MEP, Finnish Prime Minister and recent EPP Spitzenkandidat shortlistee, Alexander Stubb graces this issue's cover in an exclusive interview. Also inside, Czech deputy Pavel Poc explains why the problems surrounding the safety evaluations of glyphosate have shown the urgent need to improve the transparency of assesment processes, while our roving reporter Martin Banks investigates why local and regional leaders in the CoR and EESC are voicing mounting concern about the prospect of a no deal Brexit. MEPs Herbet Dorfmann, István Ujhelyi and Patrizia Toia contribute key articles in our feature on Smart Technologies while Henna Virkunnen and Pavel Telička look at where the EU is on delivering 5G networks and the new Connecting Europe Facility. As the balance in European sentiment increasingly leans to the right, veteran politician Alexander Stubb tells Lorna Hutchinson that election candidates need to become more personal if they are to strike an emotional chord with people on what it means to be European. Let’s focus on the man, not the ball, argues Jacob Hansen.